Create great videos with your latest drone, adventure or holiday footage! Software and workloads used in performance tests may have been optimized for performance only on Intel® microprocessors. Performance tests, such as SYSmark and MobileMark, are measured using specific computer systems, components, software, operations, and functions. Any change to any of those factors may cause the results to vary. You should consult other information and performance tests to assist you in fully evaluating your contemplated purchases, including the performance of that product when combined with other products. 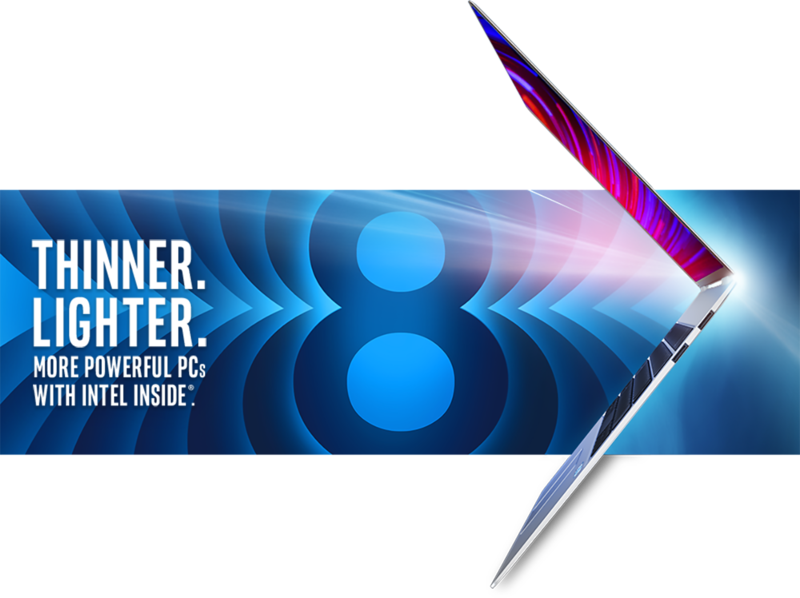 For more information, go to www.intel.com/benchmarks. 1 As measured by MAGIX Fastcut Video Create Workload: The workload video is a 9 min. 21 sec., 3840x2160, ~59.9Mbps, H.264, 3.89GB, .mp4 file. The "A Cold Place" template is applied and is exported using the Full HD setting. The output video is a 38 sec., 1920x1080, ~20Mbps, H.264, ~93MB, .mp4 file. Measured on Intel Reference Platform: : Intel® Core™ i7-8550U Processor, PL1=15W TDP, 4C8T, Turbo up to 4.0GHz, Memory: 8GB DDR4-2400, Storage: Intel 600p SSD, Intel UHD Graphics 620, OS: Windows* 10; versus previous generation: Intel® Core™ i7-7500U Processor, PL1=15W TDP, 2C4T, Turbo up to 3.5GHz, Memory: 8GB DDR4-2133, Storage: Intel 600p SSD, Intel HD Graphics 620, OS: Windows* 10. 3 As measured by WebXPRT* 2015 on Intel Reference Platform: Intel® Core™ i7-8550U Processor, PL1=15W TDP, 4C8T, Turbo up to 4.0GHz, Memory: 8GB DDR4-2400, Storage: Intel 600p SSD, Intel UHD Graphics 620, OS: Windows* 10; versus previous generation: Intel® Core™ i7-7500U Processor, PL1=15W TDP, 2C4T, Turbo up to 3.5GHz, Memory: 8GB DDR4-2133, Storage: Intel 600p SSD, Intel HD Graphics 620, OS: Windows* 10. 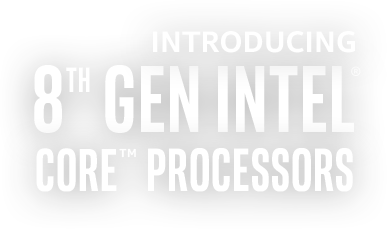 Intel is a sponsor and member of the BenchmarkXPRT Development Community, and was the major developer of the XPRT family of benchmarks. Principled Technologies is the publisher of the XPRT family of benchmarks. You should consult other information and performance tests to assist you in fully evaluating your contemplated purchases. © 2017 Intel Corporation. Intel, the Intel logo, Intel Core, and Intel Inside are trademarks of Intel Corporation in the U.S. and/or other countries. *Other names and brands may be claimed as property of others.